MIAMI (Reuters) - A Miami judge temporarily blocked media access to any more semi-clad video images of Justin Bieber filmed while the teenage pop singer was in police custody last month after his arrest for driving under the influence. Miami-Dade County Judge William Altfield ordered that about 10 hours of police surveillance video not be released until he has been able to review them in his chambers. 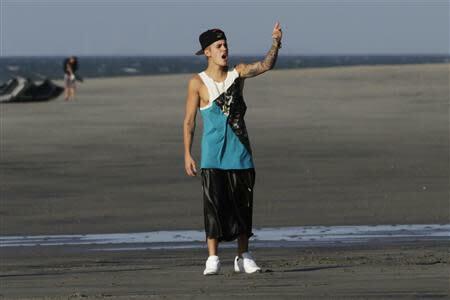 The footage included clips of Bieber giving a urine sample. "While in custody at the Miami Beach police station, the defendant was captured on videotape in various states of undress which show intimate personal parts of the defendant's body," according to a legal motion filed earlier this month in Miami-Dade County Court by Bieber's Miami law firm. One video showing Bieber being patted down by a Miami Beach officer was already released to the media in early February, the motion states, in violation of the law and before the singer's lawyers were notified of its existence. The motion said the Florida constitution and state law protected such images from being publicly disclosed. Releasing video from Bieber's brief time in custody would cause "irreparable harm," the teen's lawyers say, requesting that they be allowed to view the images before any decision is made to release them to the media under Florida's liberal public records law. "I am at this time ordering the Miami Beach Police Department not to disclose the records until such time as this court has made a decision," the judge ruled after an hourlong hearing. Altfield said he would announce his decision at a March 4 hearing, although less-revealing video clips from Bieber's hours in custody may be released at an earlier date if his lawyers agree. At issue are four short clips of Bieber urinating at the police station, partially obscured by a low wall, the court heard. Bieber, 19, was charged with driving under influence, resisting arrest and using an expired license after Miami Beach police say they caught him drag racing on January 23. He has pleaded not guilty to the charges and did not attend the hearing on Thursday. Besides a small amount of alcohol, he had marijuana and prescription medication for anxiety in his system at the time of his arrest, according to the state attorney's office. Lawyers for several major media companies, including the Miami Herald, CNN, the Orlando Sentinel and the Associated Press, deny Bieber has the right to privacy under Florida's Public Records Act, according to court documents. Reuters is not a party to the case. "Florida courts have long recognized that government records are presumptively open, and that the Public Records Act is to be construed liberally in favor of access," Deanna Shullman, a lawyer representing the media, stated in court documents. Florida courts "reject the notion that simply alleging embarrassment alone is sufficient grounds to trump Public Records Act disclosure mandates," Shullman wrote. The Miami Beach police declined to comment. Bieber, whose private life has taken a tumultuous turn in the past year, was also charged last week with assaulting a limousine driver in Toronto in December. The Miami case is State of Florida v Justin Drew Bieber, B14-2900.